U.S. bank stocks like Bank of America (NYSE:BAC) haven’t had a particularly spectacular 2018. BAC stock, for instance, is up less than 2% so far this year. It’s pulled back about 9% from March highs — and hit a seven-month low in July before rallying. Strictly looking at the numbers and the news, including a strong second-quarter earnings report on Monday, the weakness doesn’t make much sense. Earnings are soaring, with earnings per share up 43% in Q2 after a 38% rise in Q1. Interest rate hikes should be coming, as Federal Reserve Chair Jerome Powell predicted on Tuesday. The economy is strong. Unemployment remains low. It’s seemingly all good news. And yet BAC stock is little better than flat — and it’s performed well this year relative to peers. JPMorgan Chase (NYSE:JPM) is up 3.3% so far this year. Wells Fargo (NYSE:WFC), Citigroup (NYSE:C), and PNC Financial (NYSE:PNC) all are down year-to-date. (C and WFC have lost more than 6%). But there is some logic for the weakness — even if I remain bullish on BAC. I’ve long argued the stock is attractive, and along with JPM head and shoulders above other big bank stocks. That said, I do get why investors have been rather tepid toward the sector this year — even if I believe it represents a buying opportunity. As I wrote after JPMorgan Chase’s Q1 report, there’s a sense that the market has “sold the news” when it comes to U.S. banking stocks. The sector soared after the U.S. presidential election in November 2016 — because investors (rightly) saw a number of catalysts. A Republican-dominated federal government could weaken some of the more restrictive Dodd-Frank regulations. A corporate tax cut would increase earnings — and potentially increase activity in commercial and investment banking. In turn, that cut could boost near-term economic growth — and get interest rates off the near-zero levels that had pressured big bank’s net interest margins. It’s a valid question. To be sure, the good news isn’t necessarily ending in Q4, with Bank of America heading back to stagnant earnings growth. Additional interest rate hikes should help margins. News on the economic front is still good. But an overhaul of U.S. banking law seems highly unlikely, particularly with Democrats potentially taking back the House of Representatives in mid-term elections. The economy is strong — but it’s also heading into year 10 of an economic expansion. A downturn is coming at some point. Those risks suggest some potential caution toward bank stocks — and explain, at least in part, why BAC is trading at 10.4x forward earnings. But looking at the Q2 report, there’s also the sense that, external factors aside, 2019 will require the company to get back to grinding out growth. 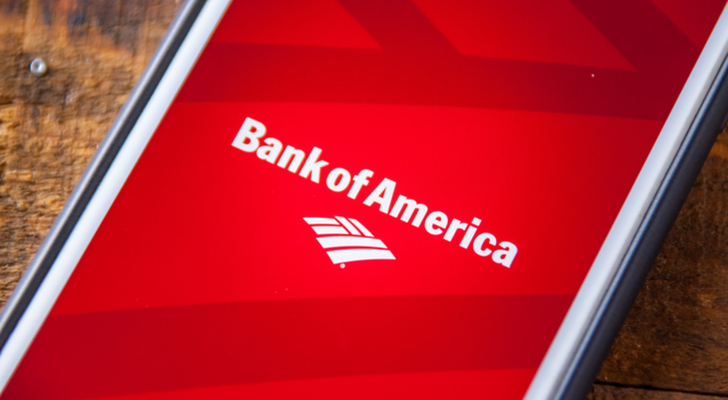 Indeed, looking at the Q2 presentation, there are signs that Bank of America’s room for improvement is getting limited. The company called out a 14-quarter streak of operating leverage (revenue growth less the change in operating expenses). But over time, that leverage is diminishing, from 20%+ in early 2015 (when the bank was making dramatic changes) to a more moderate 5% in Q1 and 4% in Q2. Global Wealth & Investment Management was flat. Total loans rose just 5% year-over-year. Aside from the EPS figure, there aren’t a lot of “big” numbers here. And that’s OK. In fact, it’s what regulators want. Big banks nowadays are supposed to be cautious. Growth comes from managing lending decisions carefully (BofA did see charge-offs and loss provisions rise modestly, but acceptably), adding deposits, and controlling expenses. The days of big-time loan growth — and big-time risk — are supposed to be over. So the skeptical response to Bank of America earnings is that while EPS growth looks tremendous, it’s not going to last. And at some point — perhaps soon — bank stocks are going to feel the pressure from a slowing housing market or rising unemployment or some other macro shock. Again, it’s a fair point. But at these valuation levels, those are risks worth taking. A 10x EPS multiple suggests either declining near-term earnings or a reasonably significant downturn in the not-too-distant future. A 1.25x price to book multiple admittedly is near post-crisis highs — but still well below 2x+ figures seen last decade. Bank of America isn’t going to grow EPS 38% or 43% next year. BAC stock likely isn’t going to rise 150%+, as it did between early 2016 and early 2018. That doesn’t mean it should be ignored. There’s still a nice path to double-digit upside over the next 12 months — 12x 2020 EPS of $3+, even assuming growth slows — and a recently raised dividend offering a 2% yield. This is still a business executing well on the consumer side, and controlling expenses across the board. There are risks, but there are risks throughout the market. Ignoring BAC at this price because it isn’t growing “fast enough” isn’t avoiding risk. It’s avoiding an opportunity. Article printed from InvestorPlace Media, https://investorplace.com/2018/07/bank-of-america-strengthens-bac-stock-doesnt/.